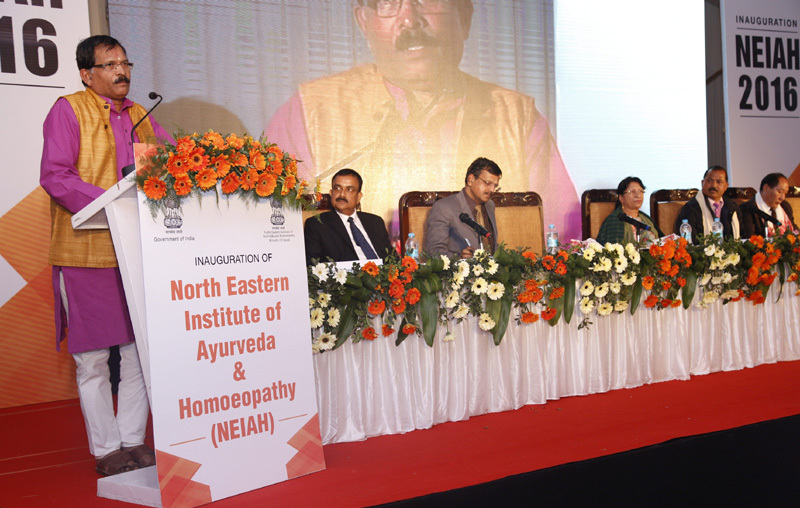 The Minister of State for AYUSH (Independent Charge), Shri Shripad Yesso Naik addressing the gathering at the inauguration of the North Eastern Institute of Ayurveda & Homoeopathy (NEIAH), at Shillong, in Meghalaya on December 22, 2016. Shillong: The Minister of State for AYUSH Shri Shripad Yesso Naik formally inaugurated the North Eastern Institute of Ayurveda and Homoeopathy (NEIAH), an autonomous Institute under Ministry of AYUSH, Government of India, in Shillong, Meghalaya today. With this, it became the second Ayurvedic College in the North East Region with a Homeopathy college and the only Central Academic Institute of Ayush. Expressing his pleasure in dedicating the NEIAH to the nation, Shri Shripad Yesso Naik was hopeful that this prestigious Institute will cater to the need of all the states of the North East. ‘The primary aim of the Institute is to produce quality human resource in the area of AYUSH in general, particularly in the Ayurveda and Homeopathy along with the Yoga systems”, Shri Naik said. The AYUSH Minister said that the establishment of this Institute will solve the problem of scarcity of doctors in remote areas of the North Eastern regions to a great extent as it will produce quality medical graduates in the stream of Ayurveda and Homeopathy; and thereby it will suitably help in implementing and improving the execution of national health policies. Appreciating the abundance of rich flora in the region and presence of folk and traditional health care practices, the Minister said that the knowledge of this traditional healer is to be preserved, need to be on a validated based on ethno botanical and scientific research with practical suitability for clinical practices. He was confident while adding that a serious involvement of this Institute in research and development will also explore herbal-agro based industry and ultimately promote the cultivation of medicinal plants in this region, which are most climatically suitable for large number of medicinal plants from high altitude to mid level altitude of the hilly areas. The NEIAH will also work with priority to popularize Panchakarma and Yoga along with production of para-medical staff for development of skill for youth of this region, the minister said. Shri Shripad Naik added, “Promotion of Panchakarma therapy for curative, preventive and promotional areas not only boost Health care sector in government and private sector but it may be amalgamated with health tourism in the areas like Shillong for promoting health tourism industries”. Wishing the people of the North East a Merry Christmas and a Happy and prosperous New Year, the minister ended his speech by adding that NEIAH will be the latest contribution to the already rich academic atmosphere of Shillong and that this step once again reiterates the fact that development of North East India is the priority of the present Union Government. Minister of Health & F.W, Govt. of Meghalaya Smt. Roshan Warjri in her speech expressed her gratefulness to the Union government for providing an Institute of this stature which the region has long yearned for. 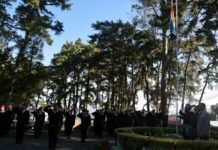 She said that government of Meghalaya has always promoted the spirit of Ayurveda and Homeopathy; and that this has always been part of mainstream public health system of the state. With the introduction of Rasthriya Bal Sawasthya Karykram (RBSK) under National Health Mission these streams have assumed greater importance, she said. 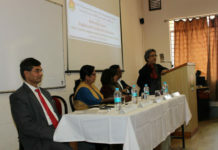 The Director of NEIAH Prof (Dr) P K Goswami earlier in his inaugural speech said that the Institute will be a unique institution which will be independent and collocated beside NEIGRIHMS with multi-speciality, where education and health care facilities through Ayurveda & Homoeopathy will be provided under one platform. The NEIAH has started functioning with one College of Ayurveda and one College of Homoeopathy from the academic session 2016-17. The Institute admitted 50 candidates each for BAMS (Bachelor of Ayurvedic Medicine & Surgery) and BHMS (Bachelor of Homoeopathic Medicine & Surgery) courses which commenced from 30th November, 2016. 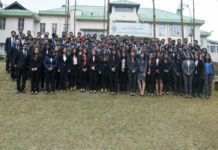 The Institute is affiliated to the North Eastern Hills University (NEHU), Shillong for both these courses. 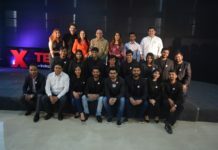 The seats are reserved for the states of North Eastern Region along with 24 (twenty four) seats under the All India Open Seats Quotas. The NEIAH is presently running with OPD and IPD (Ayurvedic & Homoeopathic) with qualified specialist doctors with all diagnostic and laboratory facilities. Free Panchakarma therapies along with free laboratory diagnostic facilities are also available. At present a 60 bedded Ayurveda Hospital and a 20 bedded Homoeopathy Hospital are functional. 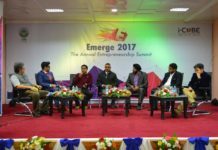 Member of Parliament (Lok Sabha), Shri Vincent Pala; Joint Secretary to Ministry of AYUSH, Shri Anurag Srivastava; Additional Chief Secretary to Government of Meghalaya, Shri Yeshi Tsering and other senior officers of Ministry of AYUSH and the Meghalaya Government were present at the function.